Bethel Powers is a master's-prepared nurse with master's and PhD degrees in social anthropology. The overall theme of her program of research is improving older adults' health and quality of life. Her earliest investigations have included multiple studies of nursing home culture and issues involving care of nursing home residents with dementia. Her research-based book, entitled Nursing Home Ethics, reviews the conditions for which nursing home care becomes a necessity and discusses practical approaches to the many everyday ethical issues that arise in long-term care. Studies involving older institutionalized persons and their families have focused on social networks and social support, delivery of palliative care, and spiritual nurturance. Dr. 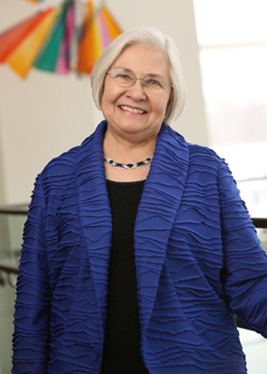 Powers also served as a co-investigator on two NIH-funded interdisciplinary team-based studies: a randomized controlled clinical trial of an intervention for improving outcomes of hospitalized older adults and their family caregivers, and an ethnographic study of acute care hospital-based palliative care consultation services. Her current co-investigator role is focused on the study of nurse in-home visiting interventions for community-dwelling older persons with existing disability and depression. As director of the school's PhD programs, Dr. Powers is committed to mentoring graduate students and working with faculty colleagues to prepare scientists and produce leaders who contribute to the dissemination, teaching, and advancement of research in academic and clinical settings and in national and international arenas. Smith, Joyce A.; Fuino, Robert L.; Pesis-Katz, Irena; Cai, Xueya; Powers, Bethel; Frazer, Maria; Markman, John D (2017). Differences in opioid prescribing in low back pain patients with and without depression: a cross-sectional study of a national sample from the United States. PAIN Reports. Lowey, Smith, Xue, Powers (2015). Opioid Use in the Last Year of Life Among Medicare Beneficiaries With Advanced Illnesses A Retrospective Cohort Study. JOURNAL OF HOSPICE & PALLIATIVE NURSING. Liebel DV, Powers BA, Hauenstein EJ. (2015). Home health care nurse interactions with homebound geriatric patients with depression and disability. Res Gerontol Nurs., 8 (3), 130-9. Liebel, DV; Friedman, B; Conwell, Y; Powers, BA (2015). Evaluation of Geriatric Home Healthcare Depression Assessment and Care Management: Are OASIS-C Depression Requirements Enough?. AMERICAN JOURNAL OF GERIATRIC PSYCHIATRY, 23 (8), 794-806. Liebel DV, Powers BA. (2015). Home health care nurse perceptions of geriatric depression and disability care management. Gerontologist, 55 (3), 448-61. Friedman, B., Yanen, L., Liebel, D., & Powers, B. (2014). Effects of a home visiting nurse intervention versus care as usual on individual activities of daily living: a secondary analysis of a randomized controlled trail. BMC Geriatrics http://www.biomedcentral.com/1471-2318/14/24, 14 (24). Friedman, B., Li, Y., Liebel D.V., Powers, B.A. (2014). Effects of a home visiting nurse intervention versus care as usual on individual activities of daily living: a secondary analysis of a randomized controlled trail. BMC Geriatrics, 14 (24). Lowey, DV, Powers, BA, Xue, Y (2013). Short of breath and dying: State of the science on opioids for the palliation of refractory dyspnea in older adults.. Journal of Gerontological Nursing, 39, 43-52. Liebel, D. V., Friedman, B., Watson, N. M. & Powers, B. A. (2012). Which components of a primary care affiliated home visiting nurse program are associated with disability maintenance/improvement?. Home Health Care Services Quarterly DOI: 10. 1080/01621424.2012.681550, 31, 155-180. Powers, B.A. & Watson, N.M. (2011). Spiritual nurturance and support for nursing home residents with dementia. Dementia: The International Journal of Social Research and Practice, 10 (1), 59-80. Powers, B.A. (2011). Critically appraising qualitative evidence for clinical decision (Chapter 6); Generating evidence through qualitative research (Chapter 18); Walking the walk and talking the talk: An appraisal guide for qualitative evidence (Appendix C). In B.M. Melnyk, E. Fineout-Overholt(Eds.) Evidence-based practice in nursing & healthcare (2nd ed.). Wolters Kluwer/Lippincott Williams & Wilkins. Powers, B.A. & Knapp, T.R. (2011). Dictionary of Nursing Theory and Research (Fourth Edition). New York: Springer Publishing Company. Norton, S., Powers, B.A., Schmitt, M.H., Metzger, M., Fairbanks, E., Deluca, J. and Quill, T. E. (2011). Navigating Tensions: Integrating Palliative Care Consultation Services into an Academic Medical Cneter Setting.. Journal of Pain and Symptom Management. Powers, B.A. (2010). Comfort feeding for persons with advanced dementia.. New York Nurse, 41 (8), 14. Powers, B. (2010). Avoiding Polypharmacy in Older Adults.. New York Nurse. Liebel, DV, Friedman, B, Watson, NM, & Powers, BA (2009). Review of nurse home visiting interventions for community-dwelling older persons with existing disability. Medical Care Research and Review, 66, 119-146. Grace, JT & Powers, BA (2009). Claiming our core: Appraising qualitative evidence for nursing questions about human response and meaning. Nursing Outlook, 57, 27-34. Powers, BA (2008). Better palliative care for persons with dementia. New York Nurse, 39 (1), 14. Messecar, D, Powers, BA, & Nagel, CL (2008). How to Try This: The Family Preferences Index. American Journal of Nursing, 108 (9), 52-60. Powers, BA & Watson, NM (2008). The meaning and practice of palliative care in nursing homes for residents with dementia at end of life. American Journal of Alzheimer's Disease & Other Dementias, 23, 319-325. Powers, BA & Knapp TR (2006). Dictionary of nursing theory and research. (Third Edition). . Powers, BA (2005). Nursing home ethics inside out.. Reflections on Nursing Leadership, 31 (3), 23-25. Powers, BA (2005). Critically appraising qualitative evidence (Chapter 6); Generating evidence through qualitative research (Chapter 11); Critically appraising qualitative research (Appendix B); & Looking for best evidence: 'A rose by any other name...' (Appendix F).. In B. M. Melnyk & E. Fineout-Overholt (Eds. ), Evidence-based practice in nursing and health: A guide to best practice., 127-162; 283-298; 491-527; 547-555. Powers, B.A. (2005). Everyday Ethics in Assisted Living Facilities: A Framework for Assessing Resident-Focused Issues. Journal of Gerontological Nursing, 31, 31-37. Powers, BA (Book Review) (2004). Ethical patient care: A casebook for geriatric health teams by Mezey, Casse, Bottrell, Hyer, Howe, & Fulmer.. For Journal of Interprofessional Care, 18, 92-94. Powers, B.A. (2003). The Significance of Losing Things for Nursing Home Residents with Dementia and Their Families (2004 Edna Stilwell Writing Award). Journal of Gerontological Nursing, 29, 43-52. Powers, BA (2003). Nursing home ethics: Everyday issues affecting residents with dementia. (2004 American Journal of Nursing Book of the Year Award). . Powers, B.A. (2001). Ethnographic Analysis of Everyday Ethics in the Care of Nursing Home Residents with Dementia: A Taxonomy. Nursing Research, 50, 332-339. Powers, B.A. (2000). Everyday Ethics of Dementia Care in Nursing Home: A Definition and Taxonomy. American Journal of Alzheimer's Disease, 15, 143-151. Kitzman, H.J., Powers, B.A., Schmitt, M.H. (2000). The School of Nursing: Integrating Practice, Research, and Education. J. Cohen (Ed. ), Teaching, Discovering, Caring: University of Rochester Medical Center 1925-2000. Powers, B.A. (1997). Social Support, Social Networks, and the Problem of Loneliness in Elder Care. E.A. Swanson & T. Tripp-Reimer (Eds.) Advances in Gerontological Nursing: Chronic Illness and the Older Adult, 136-158. Powers, B.A. (1996). Relationships Among Older Women Living in a Nursing Home. Journal of Women & Aging, 8 (4), 179-198. Powers, BA & Knapp, TR (1995). A dictionary of nursing theory and research. (Revised and Expanded Second Edition). . Powers, B.A. (1995). From the Inside Out: The World of the Institutionalized Elderly. J.N. Henderson & M. Vesperi (Eds. ), The Culture of Long Term Care: Nursing Home Ethnography, 179-196. Powers, BA (Book Review) (1993). The ends of time: Life and work in nursing home by Savishinsky.. For Medical Anthropology Quarterly, 7 (1), 112-113. Powers, BA (Book Review) (1993). Handbook of humanities and aging by Cole, Van Tassel, and Kastenbaum (Eds.). For Journal of the American Geriatrics Society, 41, 1378-1379. Powers, B.A. (1992). The Roles Staff Play in the Social Networks of Elderly Institutionalized People. Social Science & Medicine, 34, 1335-1343. Powers, B.A. (1991). The Meaning of Nursing Home Friendships. Advances in Nursing Science, 14 (2), 42-58. Powers, BA (Book Review) (1991). Cross-cultural nursing: Anthropological approaches to nursing research by Morse (Ed.). For Medical Anthropology Quarterly, 5 (4), 412-413. Jurgens, J., Powers, B.A. (1991). An Exploratory Study of Menstrual Euphemisms, Beliefs, and Taboos of Head Start Mothers. D.Taylor & N. Woods (Eds. ), Menstruation, Health, Illness, 35-40. Powers, BA (Book Review) (1991). Aging in a technological society by Lesnoff-Caravaglia (Ed.). For The Journal of Nervous and Mental Disease, 179 (4), 237-238. Smith, T., Powers, B.A. (1990). An Integrative Approach to Quality Assurance. Nursing Management, 21 (6), 28-30. Powers, B.A. (1990). Nursing and Aging. R. Rubenstein (Ed.) Anthropology and Aging, 69-105. Powers, BA (Book Review) (1990). Nursing research: A quantitative and qualitative approach by Roberts & Burke. For Research in Nursing & Health, 13, 351-352. Powers, BA & Knapp, TR (1990). A dictionary of nursing theory and research. First Edition (Japanese Language Edition 1994 by Igaku-Shoin, Ltd, Tokyo). Powers, B.A. (1988). Self-Perceived Health of Elderly Institutionalized People. Journal of Cross-Cultural Gerontology, 3, 299-321. Powers, B.A. (1988). Social Networks, Social Support, and Elderly Institutionalized People. Advances in Nursing Science, 10 (2), 40-58. Powers, BA (1988). Social support for elderly people.. Nursing Times, 84, 54-55. Powers, BA (1987). Special Features Editorial Commentary: Gerontological nursing research and anthropology of aging. Participants: Molly Dougherty (Florida) and Toni Tripp-Reimer (Iowa).. Association for Anthropology and Gerontology Newsletter, 8 (3), 3-5. Powers, B.A. (1987). Taking Sides: A Response to Goodwin and Goodwin. Nursing Research, 36, 122-126. Powers, B.A., Smith, T. (1986). An Approach to Undergraduate Student Investigations in Clinical Settings. Image: The Journal of Nursing Scholarship, 18, 15-17. Powers, BA (1985). The social networks of elderly institutionalized people.. Proceedings, Sigma Theta Tau National Conference on Social Support and Health. University of Rochester, School of Nursing and Sigma Theta Tau, Epsilon Xi Chapter.. Powers, B.A. (1982). The Use of Orthodox and Black American Folk Medicine. Advances in Nursing Science, 4 (3), 35-47.